We’re staying at a terrific little beachside resort on Ambergris Caye in Belize. It offers snug, thatch-roofed cottages, excellent food, a beautiful beach, and an infinity pool, among many other amenities. Every day, resort workers rake the sand, cart away excess sea grass that has washed ashore, and leave the beach in the pristine, white sand state that resort-goers demand. 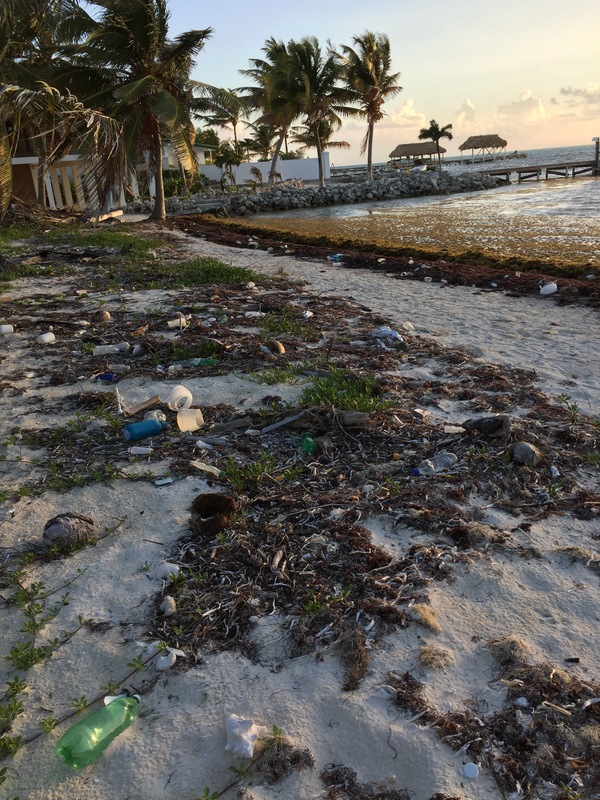 Just down the Caye, however, is an unattended section of beach, and here we get a glimpse of the impact of our plastic, disposable, consumer culture. Belize lies at the western end on the Caribbean, where the prevailing winds blow. 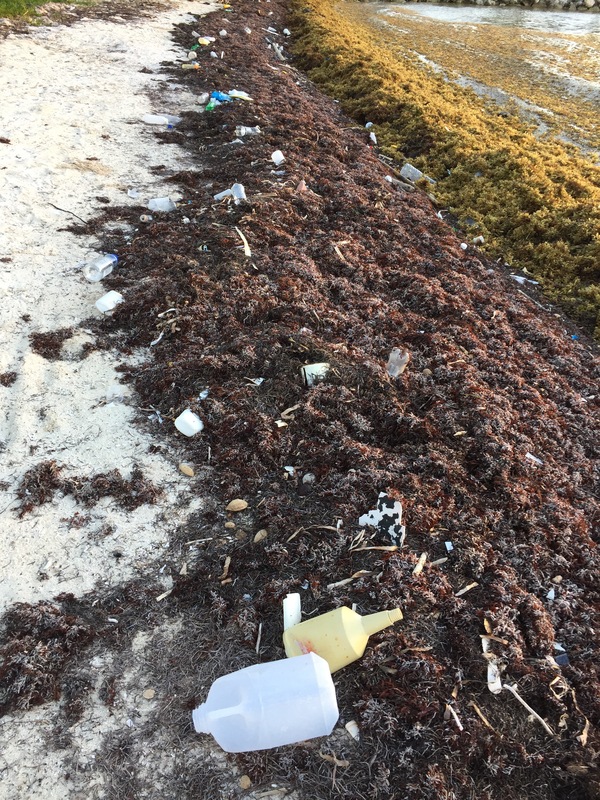 On this section of beach every imaginable bit of disposable debris — a huge range of differently sized bottles, jugs, tubs, bits of strofoam, storage containers, and even soccer balls — have collected on the sand, mingled with the sea grass. It’s disgusting, and unsightly, but mostly it’s sad. Whether through thoughtlessness or inadvertence, the human plastic culture has left its ugly mark on an otherwise pretty beach on a fine, sunny morning. If one small section of beach is bears this gross collection of crap, we can’t really begin to imagine the impact of the junk on the sea as a whole. This week I was on the road in Ohio. It was a week of gray, rainy weather, so my mood wasn’t great. Still, I was struck by how ugly our state looks from the perspective of our interstates, due in significant part to the overabundance of signs that line the highways. We’ve got a sign pollution problem. Speed limit signs and traffic alert signs. Signs stating that you need to wear your seat belt because it’s a state law. Signs unnecessarily announcing “caution overhead hazard” when there is a bridge looming immediately ahead. Signs advising that fines are doubled in work zones, mile markers, “no edge lines” signs, exit signs, rest area signs, “emergency stopping only” signs, signs listing every fast food outlet, gas station, and hotel at the exit that is approaching, signs warning that bridges ice over before roadways, merge markers, and electronic billboards about missing adults, among countless others. When I was a kid, First Lady Lady Bird Johnson launched an “America the Beautiful” campaign that sought to minimize the number of billboards on highways and their ability to block the view of the countryside. There also was a powerful commercial featuring “Iron Eyes” Cody as a proud native American who sheds a tear at the trash thrown from a passing car, which made me into a lifelong opponent of littering. Ironic that now it’s our government, with its zeal to post signs for every conceivable reason, that is the offender. Watching the video above will take about four minutes. They will be a poignant and powerful four minutes, and after they are over you will never think of littering in the same way. More information about the filmmakers, and their latest trailer about their film Midway, are available here and here and here. Thoughtless actions can have tragic consequences.